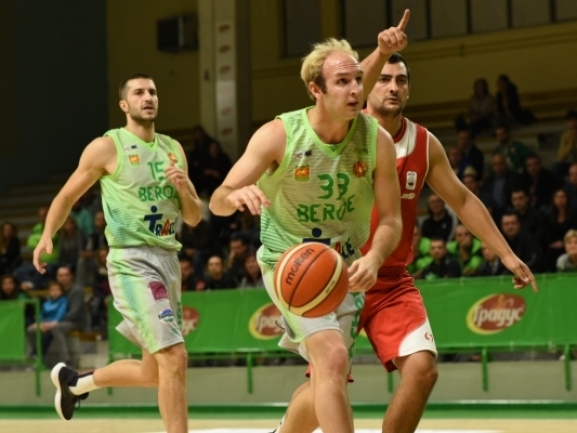 BC Beroe recorded its second straight win in the Balkan League. The Stara Zagora team hosted KK Kozuv and took 69-62 victory after having to fight a lot for it. The home side missed a lotof players as Tihomir Zhelev, Adonis Filer, James White and Ivaylo Tonev were injured. For the visitors it was the first match of the season but for sure they′ll be happy with their performance and will be looking to build on it. The next game for Beroe will be on November 13th and it′s the Bulgarian derby against Akademik Bultex 99 while on November 6th Kozuv will host KS Teuta. WIth a 7-0 run Beroe took a 9-4 lead and never surrendered it after that. The visitors however stayed really close and kept themselves in the game. Beroe′s biggest advantage in the first half was 8 points and then in the third quarter reached 10. That was also the margin after it finished but as the fourth one started on a 9-0 for Kozuv, the Macedonian side was right back in the contest. The hosts answered with 6 quick points to restore their advantage and then both teams started exchanging baskets. Kozuv was really close but never could cut the deficit to less than 4 points and the hosts held on. Conner Frankamp had another strong outing for The Greens as he finished with 26 points. Dallin Bachynski had another double-double with 15 points and 16 rebounds as Nikolay Stoyanov added 10 points and 7 assists. The visitors were led by Aleksandar Radulovic with 19 points and 9 rebounds. Aleksandar Shterjov had 9 points while Miladin Pekovic added 8.